Energy Medicine empowers you with knowledge and techniques from ancient energy healing and spiritual practices that will forever change the way you understand your emotions, health, and behaviors. Energy is the vital, living, moving force at the foundation of our well-being. Energy medicine works directly with the energies that orchestrate health, emotions, and behavior. Energy Medicine, along with Energy Psychology, is a developing complementary modality within the mind/body interaction framework. Classes will also leave you with techniques you can begin to use immediately in your own life. 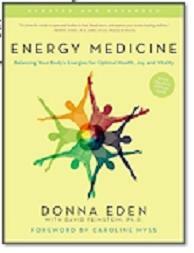 Energy Medicine for Women (book) Donna Eden's new book follows a woman's biological processes from her first period through menopause, the second prime of life, focusing along the way on PMS, fertility, sexuality, pregnancy, birthing, and the challenges and gifts of coming into the wisdom years. For each, it provides understanding along with enormously practical and effective techniques for navigating through each. Energy Medicine for Women (2-DVD set) Hormonal health is essential to a woman’s well-being, and in this DVD Eden reveals that women can manage their hormones by managing their energies. Energy medicine is beneficial in treating a host of health issues. From PMS to menopause, from heart disease to depression, energy medicine offers solutions to health issues that traditional medicine other fails to provide. Energy Medicine for Women is an indispensable health resources for women. Focusing on women's issues, the 2-DVD program provides energy techniques for regulating hormones, enhancing sexuality and fertility, easing the challenges of pregnancy and birth, managing PMS and menopause, preventing osteoporosis, and controlling weight gain. This program is taught locally by Pat Farrell, certified Energy Medicine for Women instructor. Sign up for our Monthly newsletter with examples to keep your body healthy and happy!